You can’t beat the aroma of freshly baked bread, especially when it drifts deliciously upstairs from the kitchen first thing in the morning. So much yummier than processed shop-bought, home-made bread has a superior taste and freshness, particularly when you can slice into a still-warm loaf for breakfast without having to leave the house – oh the wonders of a bread machine! It’s easy to just lift the lid and throw in the ingredients, then tuck in to the finished loaf several hours later, and perfectly satisfying too. But, convenient as bread machines are, they’re much more versatile than you might think and, with just a little more work, you and your machine can achieve so much more than just square loaf after square loaf. A bit of experimentation with flavours, textures and shapes and you could have a bakery in your own kitchen; think herbs and spices, nuts and fruit, sweet or savoury; rolls, muffins and teacakes, rings and plaits, buns and bagels, even flat breads. And if you’re not sure where to start, we’ve come up with a few unusual ideas that we hope will inspire you. Here are a couple of our favourite bread recipes for you to try at home . 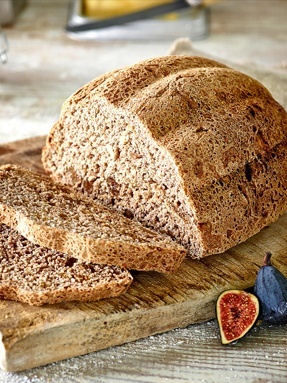 For even more delicious bread recipes visit our recipe section here. 1. Remove the pan from your bread machine and check the paddle is fitted. Fit the pan into the bread machine, add the water, oil, salt, flour, sugar and then yeast, close the lid and select the dough programme. 2. At the end of the programme, turn the dough out onto a lightly floured surface and remove the kneading paddle. Divide the dough into 4 equal portions and shape into baguettes to fit into the pans on the bread machine’s mini baguette rack. Score the tops of the baguettes and brush with the beaten egg. 3. Fit the pans onto the rack, place the rack into the bread machine, select the bake programme and choose your crust colour. 4. At the end of the programme, remove the rack from the bread maker and place the baguettes on a rack to cool. 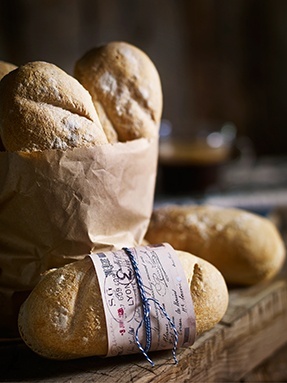 Tip: These baguettes are best eaten fresh, on the day they are made. 1. Mix the flour, salt and sugar together in a large bowl then add the yeast and water and stir until well combined. While the mix is still lumpy add the oil and knead well to make a smooth, pliable dough. Transfer the dough to a clean bowl, cover with lightly oiled clingfilm and leave in a warm place to double in size (approx. 1 hour). Meanwhile, combine the figs and walnuts with the orange juice and leave to soak. 2. Preheat the oven to 170°C/Gas 3 and lightly grease ta bread tin. 3. Turn the dough onto a lightly floured surface, add the soaked figs and walnuts with the juice then knead firmly for several minutes until evenly dispersed. Shape the dough into a smooth ball and place in a bread tin. Cover with oiled clingfilm and leave to rise in a warm place for about 40 minutes until loaf has risen and fills the tin. 4. Bake for 40-45 minutes. When cooked, the base should make a hollow sound when tapped. Remove from the tin and place on a wire cooling rack until completely cold.